Fred Hill died in prison on the 10th February 1984 while fighting against bureaucratic interference with his choice to ride a motorcycle without wearing a crash helmet. Many people may have heard of Fred Hill but not actually know who he was and why he is remembered with such respect by the Motorcycle Action Group. Fred Hill was not a natural rebel, let alone a candidate for public enemy status. Born in Yorkshire, he spent the war as a despatch rider, after which he pursued a peacetime career as a teacher of mathematics. 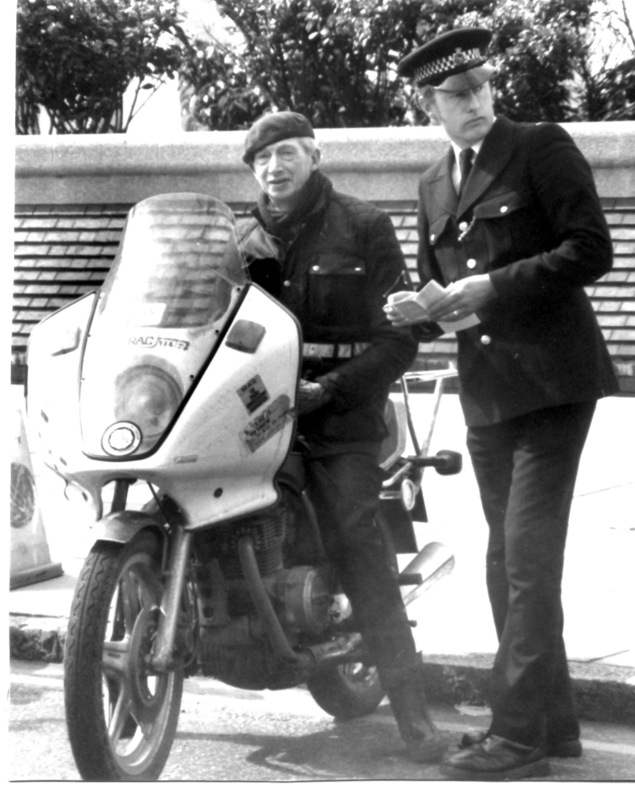 Fred’s involvement with MAG and the anti helmet law campaign began in 1976 after the Sikhs gained and exemption from the law. There were those at the time who were uncertain about Fred’s motivation, fearing that it might be racist, born of the resentment that an immigrant minority were enjoying preferential treatment. Those who met Fred, heard his speeches, and got to know him a little, were re-assured that this was not the case. If Sikhs did not have to wear helmets then nobody should have to although he rarely ever made any reference to the Sikhs' preferential treatment. While Fred’s personal campaign was passive, it was absolute, in that Fred never wore a helmet and never paid a fine. In consequence, huge number of summonses began falling through his letter box, when a journalist from the motorcycle press went to interview him in his home in Hayes, Middlesex, Fred produced a sizeable suitcase packed with summonses that he kept as souvenirs, all unpaid. It was his refusal to pay the fines, rather than the helmetless riding offence, that led the courts to imprison Fred, the charge being the more serious one of "Contempt of Court". Although he was always polite to the authorities that pursued and imprisoned him, Fred was totally unimpressed by people in high positions, and was never intimidated by them. On one occasion a woman magistrate was endeavouring to chastise Fred for breaking the law, to which criticism, Fred, implicitly referring to Emily Pankhurst and the female emancipation movement, replied, "if it hadn’t been for a woman breaking the law, you wouldn’t be sitting there now madam". Fred was sentenced to a total of 31 prison sentences over the eight year course of his campaign, sometimes for as little as twenty-four hours, rising to a maximum of two months, his final spell which he half completed in London’s Notorious Pentonville prison. On one occasion, when his one day sentence was to be served in a police cell, the desk sergeant who hadn’t bothered to lock the cell door, told Fred, "stick around until no-ones looking Fred and then bugger off". He didn’t always get off so lightly however. Once during spell inside in the winter time, some tools went missing from the prison work shop, and Fred, along with all the other prisoners implicated, was strip searched outdoors in the freezing cold. Fred wrote to his friend Brian Nicholas at the time, expressing doubts about how much more of this kind of treatment he could take. Fred’s attitude to prison life was not cavalier; he hated being locked up, particularly when he had to share cells with unsavoury people which, inevitable, he often had to do. 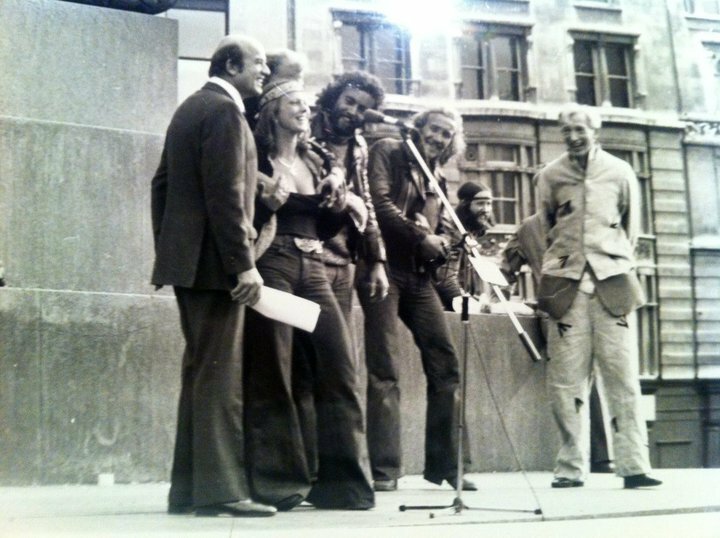 Besides enduring many prison sentences, Fred boosted the anti helmet law campaign by attending many MAG demos, at which he made speeches. Despite his age, Fred would ride considerable distances for which purpose he traded in his moped for a 250 Honda. No matter how far he had travelled or how bad the weather conditions were he always rode home the same day after a demo for his wife’s sake, and declined offers from MAG to provide him with bed and breakfast accommodation. Fred was invariably booked for riding helmetless on demos, and on more than one occasion arrested. In 1978 a run was held in Eltham, south East London, without police permission. It was only a small affair but the SPG were sent in to break it up, and Fred was arrested for assaulting a police officer. The charge was bizarre and caused the police considerable embarrassment as Fred pursued the case through the courts until his name was cleared. In his own neighbourhood however, the police usually turned a blind eye to Fred’s legal indiscretions as he rode around in his characteristic brown beret. Fred risked more serious charges by often pointing out, to the crowds he addressed and in the presence of police officers, that if everyone followed his example, the helmet law would be repealed. He could arguably have been charged with inciting others to break the law and it is to the credit of the officers present that they never chose to pursue this line. It was during Fred’s 31st prison sentence that he suffered a heart attack and subsequently died while still in custody. An enquiry, held to establish whether Fred’s treatment had contributed to his death, found no evidence for this. Clearly the stress of being incarcerated in a hostile and uncomfortable environment, particularly for a man aged 74, can hardly have been an irrelevant factor. Surprisingly the national media never latched on to Fred’s campaign, as one might expect they would, although as a human interest story his was a very powerful one. A significant exception to this blanket of silence was provided by the journalist Auberon Waugh, who not only wrote about it at the time in the Daily Telegraph, but made a point of honouring Fred each year on the anniversary of his death as long as he held the Telegraph column. The MP Matthew Parish also wrote a splendid piece charging the political contemporaries with hypocrisy in promoting freedom when such liberality cleared obstructions to making money, but inhibiting personal liberty where individual freedoms are concerned. MAG owes Fred Hill a colossal debt for the example he set us. I hope that this article will make people realise why MAG continues to argue for voluntary helmet use. The best way that we can attempt to repay the dept we owe Fred Hill is to keep alive the issue that he believed so strongly in. Please note that MAG is not against the wearing of helmets, merely the infringement of personal choice in being forced to. The helmet law marked the start of the long series of laws imposed upon bikers and scooterists by misguided politicians, who think we need protecting from ourselves, which have culminated today in flawed proposals for legislation including leg protectors, air bags, day-glo clothing and design restrictions, most of which have been proved to do more harm than good while destroying the concept of the motorcycle as a cheap, economical, environmentally friendly and fun form of transport.